1. 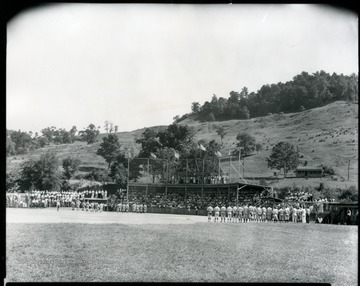 Pre-Game Ceremony at Baseball Field, Grafton, W. Va. Pre-Game Ceremony at Baseball Field, Grafton, W. Va. Baseball team members participate in a pre-game ceremony. 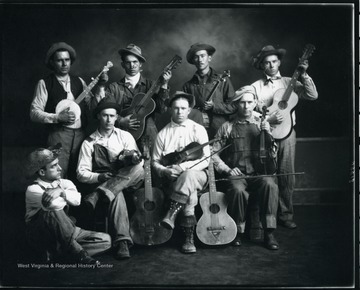 The Moatsville String Ticklers band pose with their instruments. None of the musicians are identified. 3. 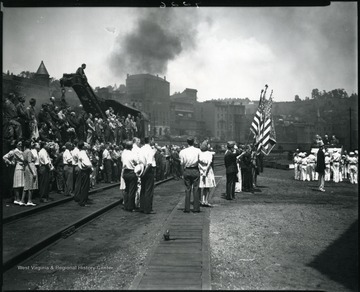 Ceremony at Baltimore and Ohio Railroad Yard, Grafton, W. Va.
Ceremony at Baltimore and Ohio Railroad Yard, Grafton, W. Va.
Men, women, and children gather at a ceremony at the Baltimore and Ohio railroad yard in Grafton, W. Va.
4. 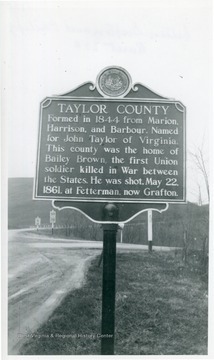 Taylor County Marker on Route 250 Between Grafton and Philippi, W. Va.
Taylor County Marker on Route 250 Between Grafton and Philippi, W. Va.
5. Pruntytown Methodist Church, Pruntytown, Taylor County, W. Va.
Pruntytown Methodist Church, Pruntytown, Taylor County, W. Va. 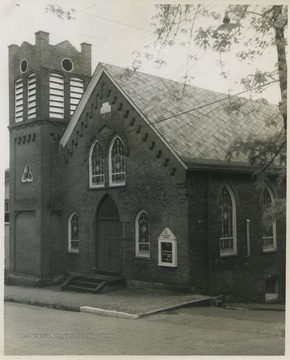 The church was organized prior to West Virginia becoming a state in 1821 in what was then known as Williamsport, Virginia. 6. Beulah Baptist Church of Pruntytown, Taylor County, W. Va.
Beulah Baptist Church of Pruntytown, Taylor County, W. Va. The church was organized in 1818. 7. Warder Chapel at the West Virginia Industrial School for Boys, Pruntytown, Taylor County, W. Va.
Warder Chapel at the West Virginia Industrial School for Boys, Pruntytown, Taylor County, W. Va. 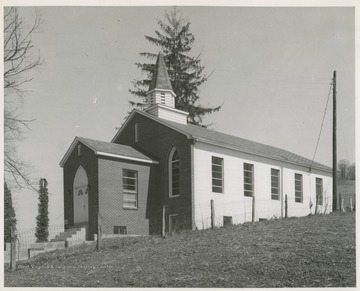 The chapel was built in what was then Williamsport, Virginia, twenty years before West Virginia became a state. 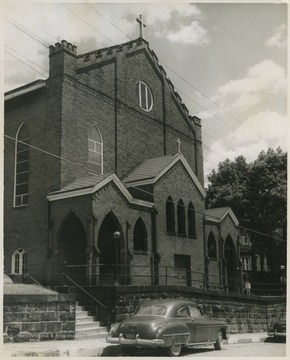 The building served as a Methodist Protestant church until the Union of Methodist Churches in 1939. 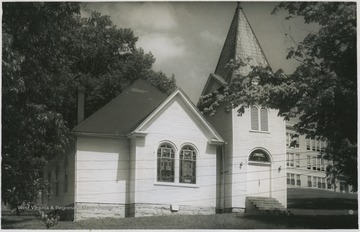 In 1947, the church and its grounds were sold to the Industrial School and was designated the school's institutional chapel. 8. First Baptist Church, Grafton, Taylor County, W. Va.
First Baptist Church, Grafton, Taylor County, W. Va. 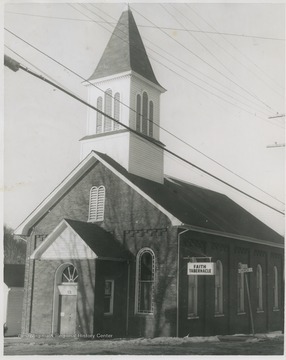 The church was established in 1858. 9. West Main Street Methodist Church, Grafton, Taylor County, W. Va.
West Main Street Methodist Church, Grafton, Taylor County, W. Va. The church was originally established as the Fetterman Methodist Episcopal Church in 1873 and is the "Mother of Methodism" in the area. 10. The First United Presbyterian Church of Grafton, Taylor County, W. Va. The First United Presbyterian Church of Grafton, Taylor County, W. Va. 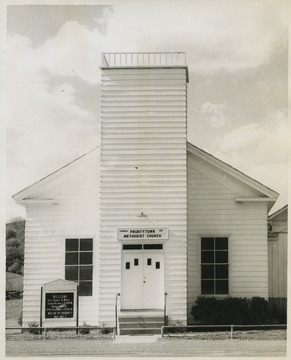 The church was organized in 1855 in what was then known as Fetterman, Virginia. During the church building's construction, services were held in the carpenter shop of the Baltimore & Ohio Railroad Company in Grafton. 11. St. Augustine Catholic Church, Grafton, Taylor County, W. Va.
St. Augustine Catholic Church, Grafton, Taylor County, W. Va. 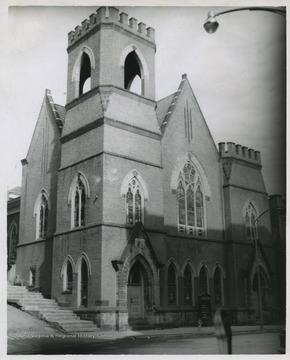 The church was established in the 1850's when Irish and German settlers came to the town of Grafton to build the Baltimore and Ohio Railroad (B. & O.). 12. Knottsville Methodist Church, Taylor County, W. Va.
Knottsville Methodist Church, Taylor County, W. Va. 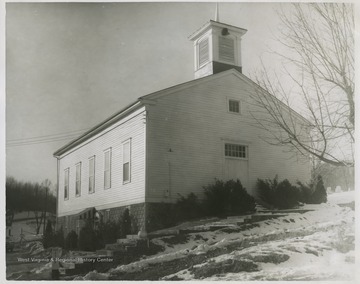 The church was established in 1811 and the building served as a community "Meeting House" as well as a school.